Regular PVC (polyvinyl chloride) is a common, strong but lightweight plastic used in construction. It is made softer and more flexible by the addition of plasticizers. If no plasticizers are added, it is known as uPVC (unplasticized polyvinyl chloride), rigid PVC, or vinyl siding. Nominal Size 1/2" to 8"
Supreme “lead free”aqua Gold high pressure uPVC solvent weld plumbing system is an economical solution that is suitable for a wide variety of applications that involve transportation and distribution of potable water. This hygienic and cost effective system is not only technically superior to conventional GI systems but offers many additional advantages over them. Easy to install and functionally most suitable for plumbing application like terrace looping, down-take and up-take lines, concealed pipe work, this system ultimately costs almost half of the conventional systems and yet has a much longer life span. This system has the approval of M.C.G.M. Ajay Greenline is made from environment friendly, lead free UPVC compound. It is ideal for cold water plumbing applications. The UPVC compound is high quality, high strength and UV stable. The Plumbing system exclusively for cold water plumbing is non- toxic, non- corrosive and does not allow any bacterial growth. Ajay also ensures that its technical team is available to provide training and services round the clock for single family homes, large residential buildings, commercial buildings, hotels, and hospitals. 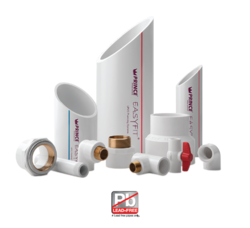 Easyfit UPVC plumbing system is a ‘LEAD FREE’ solvent weld system designed for distribution of potable water that is technically superior and offers many advantages over conventional G.I. Piping system. This system is easy to install and offers a long service life. It is used mainly for cold water application in residential, Commercial and public complexes. 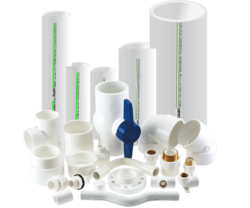 Looking for UPVC Pipes and fittings ?